The purpose of the Priciples of Community Initiative is to develop and exemplify a set of community-wide core values for diversity, equity and inclusion that provide the foundation for a University culture defined by excellence through the affirmation of difference. 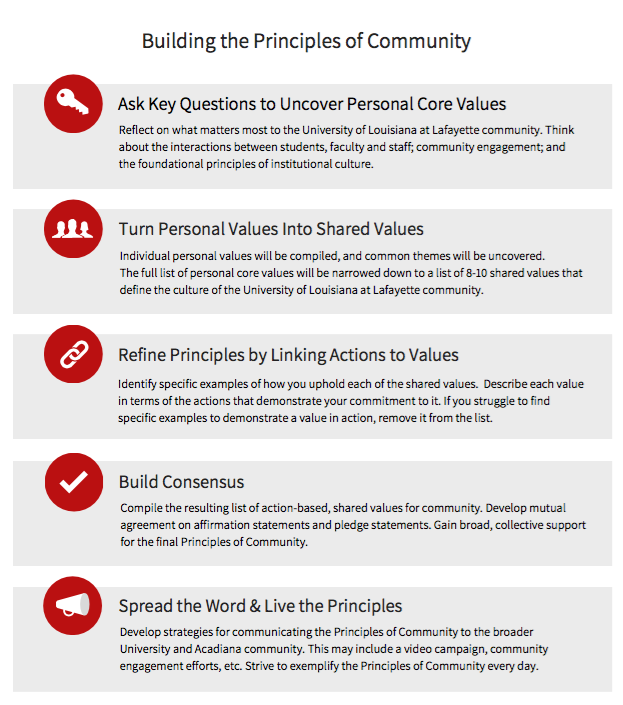 With broad input from community stakeholders, the University of Louisiana at Lafayette's Principles of Community will be based on a set of core values demonstrating the commitment of students, faculty, staff and community members to diversity, equity and inclusion. We are inviting participation from students, faculty, staff, alumni, and community members. We will use the following process to guide the creation of our Principles of Community.